8/6/1984: The City of Augusta executed an agreement with the Department of Natural Resources in the amount of $35,000 for the first phase development of the 1.2 acre Bay Street Esplanade Project (renamed Riverwalk Project) and the golf exhibition. 8/15/1984: Contractual relationship with American City Corporation terminated after several months of technical and professional consulting services to Augusta Tomorrow, Inc. and the City of Augusta advising on the organizational and administrative steps necessary to enable Augusta Tomorrow, Inc. to carry out the development program. On this transition date, Augusta Tomorrow, Inc. assumed full responsibility for the implementation work previously handled by American City Corporation. The initial contracts with American City Corporation were necessary and productive, but they were also expensive to maintain. 10/15/1984: Augusta Tomorrow entered into an agreement with the City of Augusta to prepare and administer a Riverwalk feasibility study and plans for a golf exhibition. The $35,000 for this study was granted by the Office of the Governor and channeled to the City through the Department of Natural Resources of the State of Georgia. 10/18/1984: Augusta Tomorrow opened its own office with staff to continue implementation of downtown improvements. The office was open part-time for the remainder of the year and then full-time thereafter. The office was located in the Trust Company Bank building and remained jointly funded by the eleven private members of Augusta Tomorrow and the City of Augusta. 11/5/1984-12/31/1984: City of Augusta formally contracted with Augusta Tomorrow, Inc. to assist in implementing the Downtown Development Plan. With this agreement, Augusta Tomorrow, Inc. agreed to: provide staff services (both administrative and clerical) for the Augusta Port Authority, to assist the City in implementing the Downtown Development Plan as prepared by the American City Corporation and assist in the preparation of financial packages and Urban Development Action Grant (UDAG) applications. 11/9/1984: A ceremony for the groundbreaking for Lafayette Center was held. At the groundbreaking federal HUD funding for this project was presented to the Mayor. Augusta Tomorrow board members were promoters, developers and investors in this master plan project. 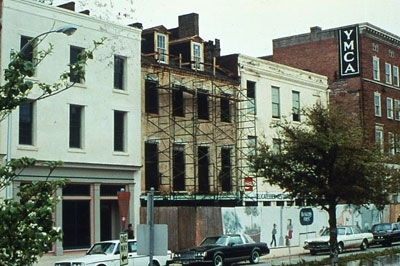 The project was called the Bankers First Project before being renamed Lafayette Center.